KennelFresh from AMS was developed specifically to reduce odor, ammonia, moisture, and aid in controlling insects in litter boxes, kennels, hutches, stables, and cages. KennelFresh was designed specifically for pets, and the people who take care of them. It absorbs harmful ammonia gases before your pet can be exposed to them, as ammonia has long been determined to be extremely detrimental to the respiratory systems of animals, especially young animals who lack control and wetting is a daily issue. KennelFresh retains ammonia; however the absorbed moisture will be dispersed back into the air, returning the powder to its original absorbing properties until the saturation level is reached. It also eliminates moisture in bedding, extending bedding life and reducing moisture that insects and parasites need to survive improving your pet's environment beyond odor control. This ability to disperse moisture is found only in KennelFresh making it a highly desirable product for use in cages, kennels, runs, doghouses, litter boxes and clinics. Essential oils in the product replace the harmful ammonia gas with a pleasant smell and serves as an insect repellent and may help dry skin. Many commercial products have been used to control ammonia levels, but unlike KennelFresh many are un-natural chemical based products that can irritate or burn skin and soft tissue and simply mask the ammonia smell through cosmetic effects. Other mineral products have also been used as absorbents; however these products do not tightly bind the ammonia releasing the harmful gases back into the environment. Apply directly to the wettest areas of bedding or litter, kennels, dog houses and runs, concentrating the product on the areas that become saturated with urine and manure. The absorption of ammonia and moisture will occur immediately upon contact. 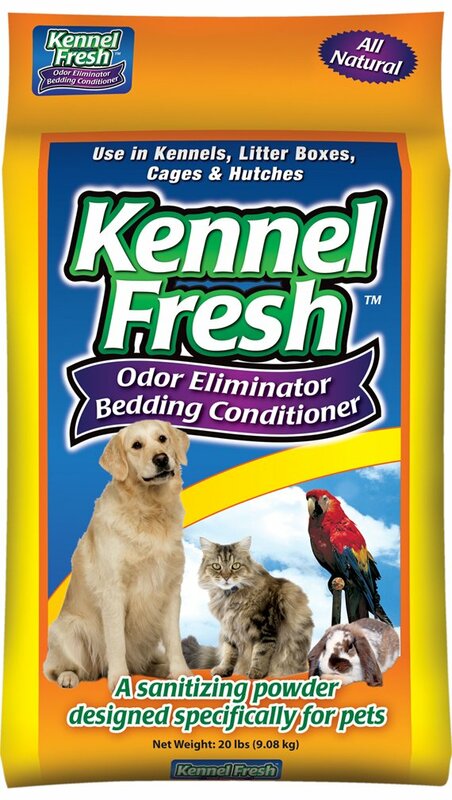 KennelFresh is the latest in our "fresh" product line. TrailerFresh and StallFresh have been used effectively for over 10 yrs. in more than 40 countries.